Android users are surrounded with several apps to download from both google playstore and other sources. There are millions of applications for almost every category of human beings. There are apps with different tasks and functions and one of the popular apps are keyboard apps as we need them for typing. 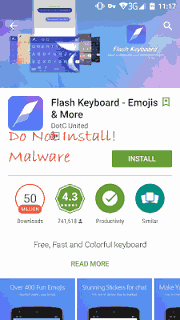 Flash Keyboard is among the most popular applications in Google playstore as it has recorded over 50 million downloads and was sometime ranked as the 11th most popular app on playstore but unknowinglyto users, the app is full of malware and not safe for users. This was recently discovered by a UK-based cyber-security firm by name Pentest. 1. The app requires unwanted access to a phone’s Bluetooth connection, geo-location feature, or Wi-Fi status which is not ideal for a keyboard app. 2. The app always ask for access to kill background processes, read SMS messages, show system overlays, or remove download notifications. Pentest says there are no reasons for a keyboard app to require these intrusive permissions. 3. Flash Keyboard was asking for device admin permissions, and was using these powers to take over the smartphone’s lock screen and show ads even if users opted out. 4. Flash Keyboard secretly transfers data to secret servers located in China and other foreign countries. The app transmitted sensitive user data including the owner’s email address, device manufacturer, model number, IMEI and Android version to what it believes to be analytics servers in the US, Netherlands and China. 5. Flash Keyboard sends details of the currently connected Wi-Fi network and others in the proximity, the identity of the mobile network being used and GPS coordinates that are accurate to within three meters of the user.